The Johan Sverdrup partnership has now decided to proceed with (DG2) Phase 2 of the Johan Sverdrup development, awarding FEED contracts to Aker Solutions, Kværner and Siemens. "Statoil: Proceeding with Phase 2 of the Johan Sverdrup development"
Phase 1 of Johan Sverdrup is under development, with first oil scheduled for late 2019. The partners will now proceed with maturing Phase 2 for the investment decision and submission of the plan for development and operation (PDO) in the second half of 2018. Phase 2 is scheduled to come on stream in 2022. “We must take a generational perspective on the Johan Sverdrup development. Working closely with partners and government authorities we now have a plan for Phase 2 that maximises value for society, industry and the licensees”, says Statoil’s project director for Johan Sverdrup, Kjetel Digre. “The Johan Sverdrup suppliers have demonstrated a willingness and capabilities to develop good solutions in a partnership with us. The contributions have been key to the improvements we have achieved so far. We are pleased to see that this trend is being progressed in the awarded FEED contracts. And we see that Norwegian suppliers are competitive in an international market,” says Digre. Statoil has implemented several improvement programmes for phase 2 in the Johan Sverdrup development. Capital expenditures for Phase 2 are now estimated at between NOK 40 – 55 billion (NOK billion nominal, fixed currency and excluding IOR), halving the estimate since the PDO was submitted for Phase 1 of Johan Sverdrup. “The quality of phase 1 and the improvement work we have performed with our partners and suppliers for phase 2 has enhanced profitability. The break-even price for the full-field development is now less than US$25/bbl and with an ambition of a world class recovery rate of 70%” says Digre. 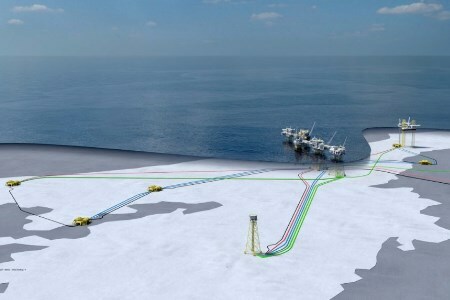 The partnership has also decided on the development concept for Johan Sverdrup. Phase 1 of the development establishes a field centre consisting of four platforms on the field. Phase 2 builds on this infrastructure, adding another processing platform to the field centre. Overall this will result in a processing capacity of 660 000 bpd. Power supply from shore, Siemens. Phase 2 also includes the development of the Avaldsnes (east), Kvitsøy (south) and Geitungen (north) satellite areas to be phased in for processing and export on the field centre. 28 new wells are planned to be drilled in connection with the Phase 2 development. The Phase 2 concept also includes the establishment of an area-wide solution for power from shore for the Utsira High by 2022. Maturing and planning Phase 2 parallel with the development of Phase 1 will ensure a consistent full-field solution and cost-efficient hook-up when Phase 1 is on stream. With a field life estimated at 50 years, Johan Sverdrup will generate great value for society and the partners.